Description: Little helpers can pretend to do household chores just like mom and dad with this handy multi-purpose fun cart! The cart holds all of the accessory tools including a motorized weed trimmer, a hand vacuum with multi-colored "dust bunnies" that swirl around inside, a rake, a broom, and more! Requires 2 AA-size batteries. Designed for children ages 2 to 6 years old. 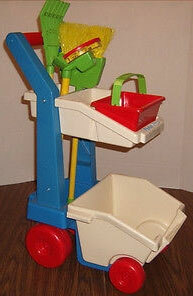 Blue Little Helper Cart with 2 large red wheels in the back and 2 smaller red wheels in the front. The cart has a red handle and a white upper and lower storage trays. The bottom tray tilts forward to double as a dust pan or to dump contents. Yellow motorized weed trimmer with a red base. The base is covered with a clear plastic dome and a green shield. A yellow disk spins inside the dome. Yellow pretend hand vacuum with a blue On/Off button. The vacuum has a clear plastic vacuum nose with multi-colored "dust bunnies" that swirl around inside. Red rectangular plastic tool tote container with a yellow hard plastic handle. This container fits in the upper storage tray on the Little Helper Cart. *See "Variations" below. Green plastic rake with a yellow handle. Green plastic broom with yellow bristles, a yellow handle, and a green grip handle on the end of the handle. Green plastic hand shovel. *See "Variations" below. Red rectangular plastic tool tote container with a green hard plastic handle. This container fits in the upper storage tray on the Little Helper Cart. 1988 - This set was sold in a 16-1/4" long, 24-3/4" high, 8-1/4" deep box. 1989-1990 - This set was sold in a 14-1/4" long, 32-3/16" high, 9-1/2" deep box. The hand vac was also sold individually in red opposed to yellow in 1989's #2016 Magic Mini-Vac.